If a post implores you to be the first to wish a sick or sad person happy birthday, it’s likely part of a cynical social media strategy. Hi I’m Jessica. Suffering from blood cancer. Today is My Birthday. But no one wished me yet. I am smiling. But sad in my heart. 😥Can I get some best wishes? The original tweet generated over 11,000 retweets in less than 24 hours, and landed on other notable social media accounts as well, including the Facebook page of political pundit Ann Coulter. The only problem is that this same image has been used has been used by myriad social accounts in ways that seem cynically designed to garner clicks and shares through ostensibly benign well-wishing. While we do not know the details of the individual in the photograph, its popularity derives not from people who know or care for the individual, but, instead, from people who need a shareable photo and caption that drives viewers to “like and share” the post, thereby increasing audience size. We know this because the photograph has been shared numerous times with numerous similar but varying descriptors since at least early 2017. I’m happy, today was my last day of chemotherapy. I defeated cancer. Congratulate me by leaving a love and an amen. That post linked to a since-deleted Facebook page belonging to “Marie Gelmi.” That profile, when it was live, was included in a French blogger’s February 2017 list of predatory Facebook accounts. A screenshot of the page hosted on that blogger’s website shows that it once had over 300,000 followers but primarily posted pictures of women who also appear, identically, on other Facebook pages. My mother said no one shares my posts because I have cancer can I get your amen here? if you’re not ashamed of me. 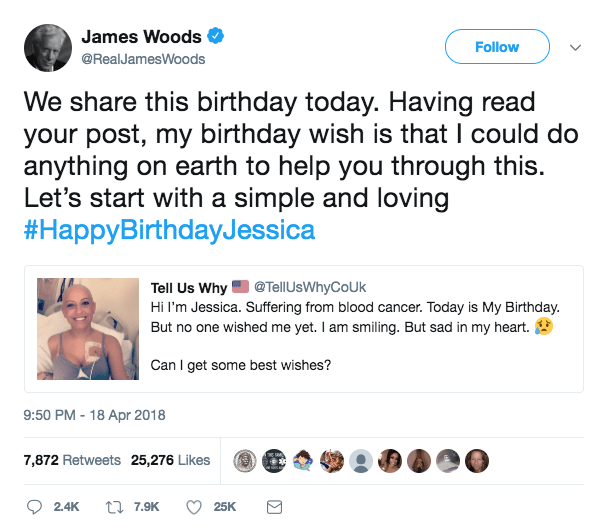 On 15 April 2018, the Facebook page for “Tell Us Why” posted an identical version of the meme that their twitter page would subsequently post on 18 April 2018, with both posts claiming that the respective days on which they were written were Jessica’s birthday. Astute readers may note that each iteration of the meme asks viewers to perform an action on the post — generally to leave a comment on it. Doing so, in broad terms, increases a post’s engagement, which can help drive traffic and build audiences. Pages that quickly build large audiences can be sold to people or companies interested in having a public Facebook page that comes with at least the appearance of a strong following. While we can’t speak to the context of the original photo or the specific motivations of the pages that continue to use it, its use on social media since 2017 has been, and continues to be, cynical and dishonest. Business Insider. 14 May 2016.